Climbing birthday parties at Edgeworks are an exciting and unique experience that your child will never forget! Parties are for all ages and abilities; we make it easy and fun by providing the climbing, equipment, staff and party lounge. Northwest Collegiate Climbing Competitions is looking for climbers from PLU, UPS, UW-T, and TCC to compete in upcoming events! Don't miss college night every Friday night at Edgeworks! About 75% of sport climbers will suffer from an upper extremity injury with 60% of these injuries involving the hand and wrist. As more people are climbing on rock walls, bouldering, and utilizing other climbing styles (other than just alpine climbing), types of injuries have also changed. 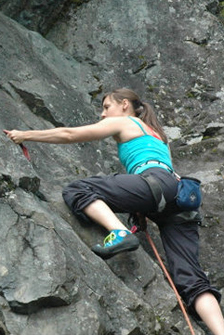 Causes of climbing injuries can range from traumatic causes to repetitive strain. These injuries involve conditions such as tendonitis, ligament sprains and other soft tissue strains, dislocations, severe soft tissue tears, and disruptions. The following are common hand and finger injuries, along with guidelines for recovery and prevention. Finger Injuries: The flexor tendons are connected to the muscles responsible for our ability to make a fist, and grip/grab objects. Compared to other muscles and tendons, those in the hand and forearm are not very strong and can be easily injured. These tendons have a series of pullies that keep the tendons in place. Disruption of the pullies are not only painful, but may cause complete dysfunction of the hand. Trigger Finger: This inflammatory disorder involving the first pulley (A1 pully) is located near the area where the finger meets the hand (the MP crease). Painful clicking or snapping will occur at the finger and often the finger will get stuck followed by a sudden release. If this is acute, often it can be treated with rest and frequent icing. Frequent opening and closing of the affected finger should be avoided. If it has been occurring for more than a few weeks, you should consider seeking medical attention. A2 pulley strain/disruption: A2 pulley injuries occur in 20% of climbers, with the ring finger being most common. 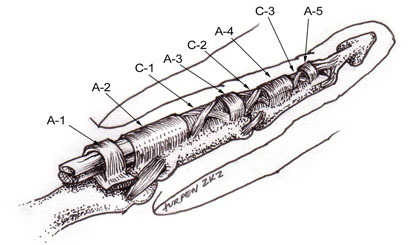 A2 and A4 pullies are absolutely crucial in keeping the flexor tendons properly aligned. Different handhold techniques put different anatomic structures at risk. Risk factor with 1 finger and 2 finger holds usually involve flexor tendon strain/disruption and/or dislocation, whereas, the crimping handhold technique, with too much stress, can cause A2 pulley disruptions. Tendon glides are one simple warm exercise that can be performed before climbing. Gliding the flexor tendons in a variety of positions can prevent inflammation in the tendons and surrounding structures. After climbing ice to minimize the effects of inflammation. Excerpt from Climbing Injuries: Prevention and Recovery by BJ Stockton and Brian Chase. BJ Stockton is a Physical Therapist with NW Sports Physical Therapy. He has a Doctorate in Physical Therapy from UPS and is a member at Edgeworks. Edgeworks Climbing Spring Break Camps are a fun and active way for young climbers of all abilities to spend their school breaks. Spend time with our youth instructors and coaches learning the basics of climbing and belaying with a mix of plenty of games and activities. An Edgeworks Spring Break Camp is adventure that you will never forget! Congratulations to Wynter Weaver for winning 1 hour of private coaching! Take the survey here and you might get picked next month! Who is your favorite setter? Can't remember names but I like to pick routes with funny or interesting names. What’s the vibe like? Always fun and upbeat. Everyone is awesome, I love that random people we don't know will encouage us, or show me a different way to get to a hold so I can complete a problem. Two words that describe the gym? Fun and fresh!